Count your blessings, guard your curses--and watch your back. . .
Sophie Lawson was seriously hoping life at the UDA would get back to relative normal now that her boss Pete Sampson has been reinstated. Unfortunately, her new assignment is sending her undercover into a realm where even the most powerful paranormals fear to tread. . .her old high school. 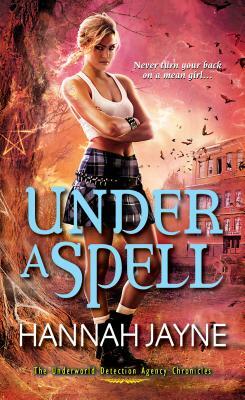 Being a human immune to magic is no defense against soulless picture-perfect mean girls--or a secret witch coven about to sacrifice a missing female student. And Sophie's Guardian, uber-proper Englishman Will, is determined to convince Sophie he's the kind of temptation she should indulge in permanently. Now as the clock ticks down to apocalypse, he and Sophie will have to summon every trick in the book to battle devilish illusion, lethal sorcery--and betrayals they'll never see coming . . .